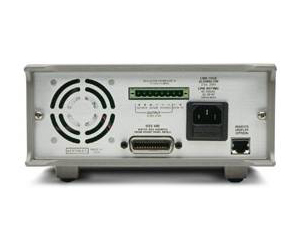 The Model 2303/2304A Power Supplies provide both voltage control and power consumption monitoring for automated testing of portable, battery-operated devices. These power supplies are optimized for testing battery-operated, wireless communication devices such as cellular phones that undergo substantial load changes for very short time intervals. These power supplies exhibit outstanding voltage stability during pulse load changes and can simultaneously measure load currents, even if they are short pulses. In addition, this family of power supplies can sink current and, thus, take on the characteristics of a discharged, rechargeable battery for testing chargers and charger-control circuitry.